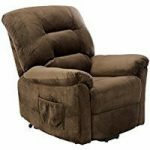 Power lift recliner provide a great option, as they can help to maintain the individual’s independence and provide a comfortable and functional recliner. Lift chairs are also built to cater specifically to a variety of health conditions, including heart issues, diabetes, dementia, chronic pain, and more with the variety of positions and features that they offer. Obviously, lift chairs for elderly users are a great choice. 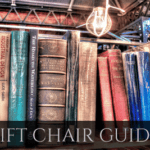 Finding the perfect lift chair can seem difficult, as models differ is size, positions, style, features, and more, but the following guide will help you select the perfect lift chair. 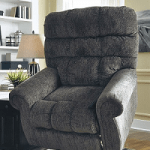 Selecting the right size lift chair for an elderly individual is critical. Not only does choosing the proper size help to ensure a comfortable fit, but it can also increase safety. Users may be prone to falling, and having a chair that is too short or too tall can result in an increased risk of falling. The perfect fit depends largely on personal preference, but here are some general guidelines. This guide is based on the proper seat width and height and the users height and weight. Lift chairs come in a variety of different positions. The positions needed or desired depend on the specific user. An elderly user may have special chair position considerations. An infinite or zero-gravity lift chair is recommended for heart problems, edema, or spending a lot of time in the chair. 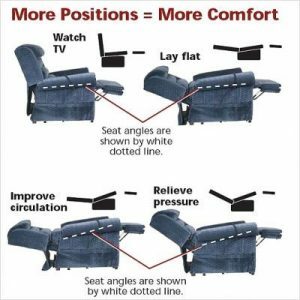 Two-position lift chairs or stand-up chairs recline back to a 45-degree angle and the foot rest can rise up parallel to the floor. The chair can also be positioned anywhere in between the sitting and reclined positions and can lift into a standing position as well. Three-position lift chairs include the same positions as two-position chairs, but they also include a more reclined napping position at around 30 degrees. Infinite position models are great lift chairs for users that spend a large amount of time in their chair because they are able to recline to a completely flat position. These chairs are ideal for those that use their lift chair for sleeping. Zero-gravity lift chairs or stand-up chairs are able to achieve the same positions as the other chairs, but these chairs can recline even further, dropping the head and back closer to the floor. The footrest can lift above parallel, and some chairs include an adjustable seat, allowing the hips to lift up higher as well. These chairs allow the feet and legs to be positioned above the lower body, which is called the Trendelenburg position. This position can help improve blood flow and circulation, which can be beneficial for heart patients or seniors with lower extremity edema. This body position can also release stress and strain on the body’s muscles and joints, providing maximal comfort. Nearly all lift chairs or stand-up chairs operate using electric controls, which helps ensure the user has full control of the chair at all times. 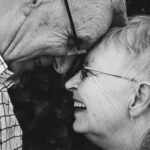 With age, a person’s mental state can begin to deteriorate and mental issues, such as dementia, can set in. Because of this, choosing a chair with simple, easy-to-use controls is critical, especially for users who already show signs of these issues. Two-Button: Many controls offer a simple two-button design, including lift and recline buttons. 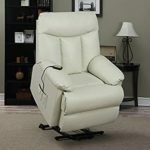 With just these two buttons, users can recline into a relaxed or sleeping position and return to a standing position. These simple controls are perfect for individuals with dementia or mental impairment. Separate Controls: Some controls also include up and down buttons to individually control the backrest and footrest. These chairs include dual motors that allow for more customizable positioning and comfort. These controls often include a button that can bring the chair to a standing position with a single press, making changing positions easy. Presets: Some controls have pre-programmable buttons that can be customized to save favorite positions, such as TV watching, sitting, sleeping, and more. Accessories: Lift chair controls are positioned on either the right or left side depending on the chair, and they can come with accessories, including a USB charger. There are many features that are available on stand-up chairs that can be especially useful if suffering from various health conditions, including diabetes, back or leg pain, neck issues, and mobility problems. Adding heat and massage functionality onto a lift chair can increase comfort and is a great way to decrease stress and relax sore and stiff muscles. Heat and massage can be especially useful for users with diabetes, as massage can help improve circulation and muscle flexibility and can decrease blood pressure, neuropathy pain, and blood sugar levels. Lumbar Support: For individuals with lower back pain, lumbar support can be a great way to increase comfort. Some chairs come with lumbar support included, while others include adjustable pillows and padding that can be setup for each specific user. Adjustable Head Rest: Some lift recliners include head rests that are adjustable either manually or through a powered control. These headrests allow for neck support to maximize comfort, and they are ideal for patients with sore muscles or cervical spine issues. Adjustable Armrests: Some chairs include armrests that can either be lowered or completely removed. These lift chairs are especially useful for individuals that have mobility issues and use a wheelchair or a scooter to assist with movement. 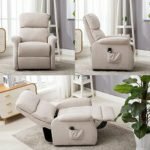 Extendable Footrest: If you or your loved one are taller or that have longer legs, an extendable footrest can provide extra leg support to make the chair more comfortable and prevent any pressure points on the lower legs. Storage Compartments: There are many varieties of storage compartments. Some chairs include storage compartments on the side where the control is positioned. In addition, other chairs may include pockets on both sides, or no pockets at all. Storage compartments can be helpful for users that need to store remotes, books and other items. Button Back: Button-back backrests are often a firmer option, and they provide a more classic-style look. Sewn Back: Sewn backrests are often quite plush. They provide similar amounts of cushioning for both the back and the neck and head. Split Back: Split back lift chairs utilize two vertical backrest pads that are split down the middle. This design eliminates direct pressure on the spine and can be useful for end users that have spinal issues, misalignment, or are recovering from back surgery. Cascading Back: Cascading backrests, also known as waterfall backrests, consist of multiple pillows stacked on top of one another. These pillows can often be unzipped and padding can be added or removed to provide specific support in necessary areas along the back and neck. Wall-Hugger Models: Some electric lift chairs are designed in a way in which they can be placed close to the wall. These products need only be placed a few inches from the wall, whereas other models may need between 18 and 30 inches. These chairs are ideal for smaller spaces, but they also generally are not able to recline quite as far. Upholstery: Electric lift chairs are available in a number of different fabrics. This ensures you can find the perfect fit for both the enjoyer and the room. There are many fabric options available in a large variety of colors. Many fabrics are stain resistant, along with other options such as leather, suede, micro suede, and more.